The overall demand for coffee has been continuously expanding for over a 100 years. Nowadays consumers everywhere expect to be served nothing less than top quality coffee; that is why every restaurant and office should always have a coffee machine on hand. Weather your coffee demand comes from customers, clients, or colleagues, its never a bad idea to have a commercial coffee machine. In any case, you have the opportunity to save money by making a coffee machine rental agreement or by leasing a coffee machine. How many cup of coffee per day will you need? What degree of quality do you want to reach? Do you only need plain black coffee or do you also want other varieties? If you're interested in finding the best deal that will save you the most money, look no further. Here we work tirelessly to help find the best solution for you. We will assist you in comparing price and quality of various coffee machine models in order to find you the best option for your business coffee needs. For further information fill out the free quote request form today and we will make you with up to four quality suppliers for leasing a coffee machine. This service is totally free of charge and you have no obligation to purchase. 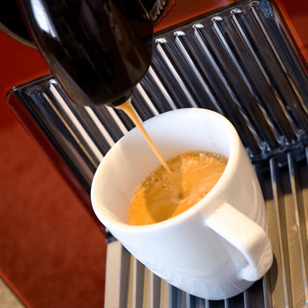 Continue reading to learn some important points to know before leasing a coffee machine. How Does it Work to Lease Coffee Machines? The decision to lease a coffee machine means that you will avoid paying the full price for your commercial coffee machine. Instead, flexible monthly payments can be made to the supplier. You can choose which coffee machine you would like for example, big or small office coffee machine. Once an agreement with a supplier has been reached, they will install the the coffee machine at the location. Operating lease - can typically be a short-term agreement where the customer rents the right to use the product and has no obligation to buy once the leasing period is over. Finance lease - also called a “lease to own” agreement is when the customer rents the right to use the product and also commits to buy the leased product at the end of the leasing period. Throughout the leasing period, the supplier claims the responsibility for insurance and maintenance of the coffee machine. If the leased machine is a coin operated coffee vending machine, then depending on your leasing agreement, the supplier will either claim all or part of the machine’s consumption revenue. Another important factor is the management and maintenance of the leased coffee machine. Depending on the lease terms, the supplier will either take full or part responsibility for operational maintenance and re-stocking. The agreed upon price to lease coffee machines is determined by factors such as, the model of coffee machine being leased, the various capabilities and functions of the machine, and the type of leasing agreement you opt for. Furthermore, the fee can be different for large commercial coffee machines and smaller coffee coffee machines. For example, leasing an instant coffee machine can vary between £5 to £30 per week. Leasing a larger unit such as a coffee vending machine can vary between £5 to £50 per week. Finally, leasing a commercial coffee machine unit can cost from £15 to £40 per week. Moreover, the fluctuation in price between coffee machine between similar and different types and models depends on what the coffee machine can offer. Less expensive units may only offer plain black coffee or very few drink options. A more expensive unit will have a larger variety of options, some of which might include popular beverages such as lattes, espressos, and cappuccinos; some might even make hot chocolate or soup. As a rule of thumb, a bean to cup machine can typically cost more because these coffee machine are able to freshly brew coffee at a very high degree of quality. If you have come to the conclusion to lease coffee machines, there are some considerations you should first be aware of before signing a leasing contract. These two points are a common mistake among many first-time-leasers and they are important points to follow in order to protect yourself from ending up in a unfavorable situation. Just like agreeing to any other contract, it is important to first read all the terms very carefully. Failure to do so could result in being locked into a contract for longer than you anticipated. Early cancellation fees may apply if you break a contract before the date stated in the lease. Double check how often your supplier is supposed to make visits for maintenance checks and restocking. It is necessary to clearly state these term in the contract to avoid any bad surprises or dissatisfied service. The frequency of visits from the supplier should be relative to the degree of usage the coffee machine undergoes; i.e. a high degree will require more frequent visits. How to Choose the Best Type of Coffee Machine to Lease? Understanding your own business needs is critical for achieving a satisfactory lease agreement. This is true because there are products on the market that are capable of satisfying any need; but there is no single product that can satisfy all needs. Therefore, match your specific needs to a correlating product and you will have a good fit. Many large office building tend to prefer bean to cup machine or built in machines because they can brew many hundreds of cups of coffee per day and require very little maintenance. Alternatively, Coffee shops of course prefer professional espresso coffee machines because they open up the potential to brew a greater degree of complex beverages. Regarding how to determine your coffee volume demand. Two thirds of the British population prefer to drink at least two cups of coffee per day at work. Respectively, a company with just 10 employees can quickly consume more than 20 cups of coffee a day. The same applies to coffee shops. If you’re looking to lease coffee machines for a cafe you will want to first roughly determine the average consumption of coffee drinks per day. Coffee is a very personal thing and as we drink it more and more, we refine our preferences to our liking. This is another factor to also take into consideration when indenting to lease coffee machines. 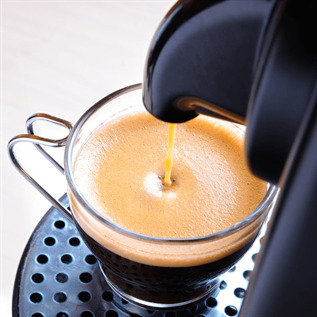 As well, if you have a demand for specialty coffees such as cappuccinos and caffe lattes, then an espresso coffee machine or a bean to cup machine would likely be an ideal choice. Alternatively, if the demand leans more towards plain black coffee or simple espressos, then you have a greater potential to save money by leasing a simple filter coffee maker. 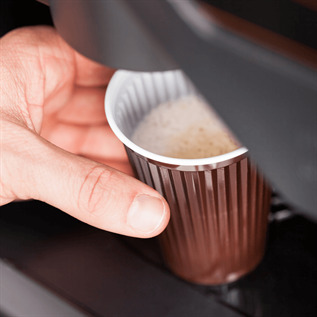 What is Partial Management for Coffee Machine Leasing? According to your business needs, this type of lease is most suitable for small businesses that don’t need many cups per day; such as a small coffee shop or an office with only a few employees. In this case, maintenance and restocking are simple tasks that won’t require visits from the supplier. This type of contract is typically cheaper because the rental fee won’t be as high and you’ll end up saving more money. Two options are available if you choose to have leasing contract with total management. One option is to have your supplier perform all the maintenance and restocking for free. However, In this case your provider exercises the right to collect all the income generated by the coin operated coffee vending machine. The second option is to have a higher monthly fee but any income from the vending machine is yours to keep. However, in this context it is still possible for your supplier to claim part or all of the revenue if those are the terms in the leasing contract. Therefore, it is important to carefully check the contract terms and compare leasing agreements from different suppliers. Afterwards, you can accurately calculate which option will provide the most utility. Ready to Start Leasing Coffee Machines? We understand the comparing price and quality of coffee machine lease agreements is difficult and time consuming work. That is why we provide this free service to all those who are interested in having a coffee machine for their business. Simple fill out the contact form at the top of the page and our team of coffee machine experts will review your business needs and match you with up to four quotes from quality suppliers of coffee machine, for free! There is absolutely no charge for this service and you are not locked into any commitment or obligation to buy. Just receive hassle-free coffee machine quotes and decide what's best for your business.